It was a pleasure and a delight for me to work with Jose Luis. He is such a dedicated artist, a talented musician, a well seasoned performer, a captivating soloist and amazing rhythm guitarist and brilliant studio producer. A dear friend who taught me how to explore the world of true Flamenco and showed me the anchoring points where ancient Arabia met with the Spain of today. The result is yet another special work of art that combines both world together. This album crosses all the barriers between the Middle Eastern sounds and the world of Flamenco music, song and dancing. We attempted to bring history into the present. Moorish migrations, North African flavours, Passionate Flamenco with Egyptian Tabla, Palmas (clapping), Oud, Nay, Guitar, Qanun Violin solos that melt the heart. Personally, I found that many of the Flamenco rhythms, in 3, 6 or 9, crossed over quite noticeably into some of our Egyptian, Moroccan and North African Shaabi (Folkloric/Popular)rhythms. Not only that, but they also had influences from the Arabian Golf and the Arabian Bedouin Dessert Tribal Polyrhythmic combinations. These rhythms have quite a strong Arabian, African and Indian influences. Composing, arranging recording this album with Jose Luis was like being in Groove Heaven. I felt that I was having a celebration with a group of beautiful Angels, dancing to music and beats created from sounds collected from all the corners of planet earth and the neighbouring planets. 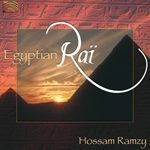 With Lots of Rhythm Hossam Ramzy Flamenco Arabe 2, A Captivating Crossover of Middle Eastern Sounds and Passionate Flamenco. The long awaited follow up to our international best seller Flamenco Arabe released back in January 2003. 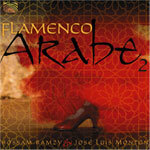 Flamenco Arabe 2 is a unique recording by master Egyptian percussionist, composer and arranger Hossam Ramzy (Peter Gabriel, Ricky Martin, Chick Corea, Loreens McKennit, Rober Plant/Jimmy Page) – “Sultan of Swing” Rhythm (UK), and celebrated Spanish flamenco guitarist Jos Luis Montn – “…a stunningly intuitive musician…” ABC (Spain). This exhilarating CD fuses pulsating Arab rhythms and percussion with fiery Andalusian flamenco. The result is a captivating and romantic Spanish/Arabian sound. Recorded in Egypt, Spain and UK, this album crosses all the barriers between the Middle Eastern sounds and the world of Flamenco music, song and dance. It attempts to bring history into the present. Moorish migrations, North African flavours, passionate flamenco with Egyptian tabla, palmas (clapping), oud, nay, guitar, qanun and violin solos that melt the heart. The album features top-class musicians; Mara Toledo – vocals, Aziz Jorge – violin, Mohammed Fouda – nay, Mohammed Naiem and, Saber Abdel Sattar – qanun, Hazem Shaheen – oud, Miguel Rodrigaez – double bass, and Atef Sobhy – bass and programming, Ossama Al Hendy – keyboards bass and Wael Naggar – accordion. Booklet Description: Full colour booklet, 12 photos, detailed artists bio, explanations of each track (in English, German, French and Spanish). CD comes with special slipcase cover.